Vega B., Lobo F.L., Zubieta J., Carolsfeld J., Zambrana I., Van Damme P.A. Vega et al. 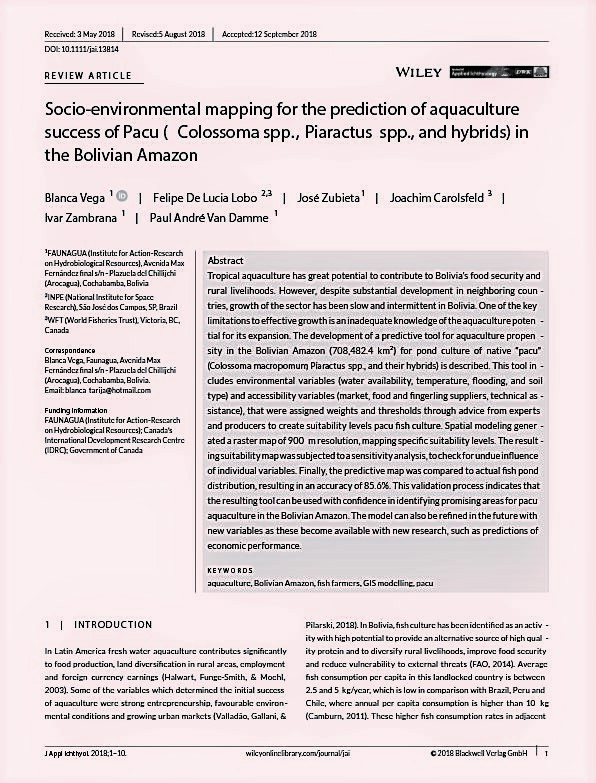 (2018) published a scientific article on aquaculture in the Bolivian Amazon. Using SIG they predict the success of pacu and tambaqui farming in the different regions of Bolivia, using social and environmental paramenters. The article has been published in the Journal of Applied Ichthyology. The articles is based on the results of exhaustive field work carried out by FAUNAGUA in the framework of the Peces para la Vida project. The article can be found in the webpage www.faunagua.org/publicaciones or can be send upon request.